HISTORY:2009 was a building year for Ladymoon. Ryan Brown (Vocals, Guitar) and Kris Potts (Bass) had been performing in various groups for years when they came across Nick Mallers (Drumset). Brown and Potts wanted to create a rock band that could incorporate the classic influences of the late 60’s and 70’s while modernizing it into a progressive psychedelic pop style. Nick quickly learned the original material and the three set out to record their first release “Resurface” in February of 2009. It took several months to mix the project and in the meantime the group was touring around the Midwest and as far as Lake Tahoe, CA. With over 100 shows under their belts the three have proven a power trio to be reckoned with. On January 1, 2010 Ladymoon debuted the finished release of “Resurface” to a crowd of over 450 people. They are currently working on a new album’s worth of songs to be recorded sometime this spring with Grammy Nominated Producer Paul Mahern whose works include The Fray and John Mellencamp. 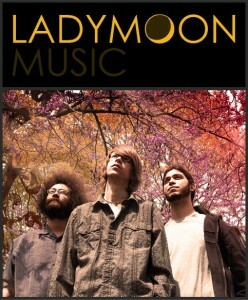 Needless to say this will be a big step in Ladymoon’s career and will further shape their sound and musical maturity. Ladymoon also has three songs featured on the independent film “My Bloody Wedding” by Morgan Mead. Morgan Mead has earned his credentials with his 2009 film “My Name Is Jerry” that received great notoriety at many film festivals around the United States. Working in collaboration with Mead, Ladymoon plans to do a series of promotional appearances as well as live performances to support the film that is to debut February 20th at the Derby City Film Festival in Louisville, Kentucky.